I am so excited about the myCharge Portable Power Outlet Charging Hub and Inverter! This amazing piece of tech is like taking a wall outlet along with you wherever you go. This heavy duty Portable Power Outlet delivers 20,000 mAh and AC 110V/65W total output power for up to 10x extra battery providing a streamlined power source of a maximum power output of 65W, enough to power a laptop or even a 34-inch LED television for up to four hours. It has a compact design, measuring 5.0 in x 5.75 in x 1.4 in, and you won't want to go anywhere without it. It's the perfect camping and tailgating companion, because it's designed to replace heavy, bulky generators and extend the life of your electronics when out of reach from a consistent power source. Power your laptop, tablet, cell phone, Bluetooth speaker, lights, fan, camping and outdoor accessories, and much more! 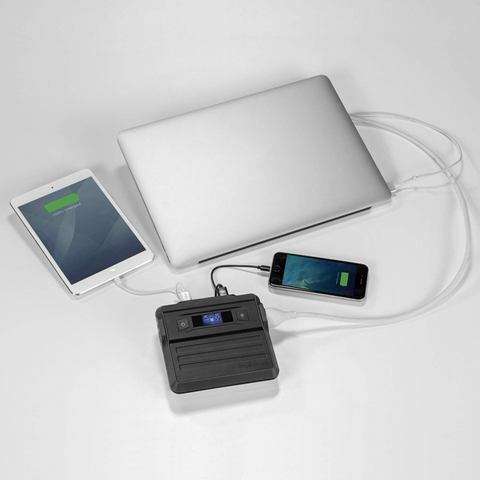 The myCharge Portable Power Outlet is rugged and durable with a rubberized finish. It is built for regular and repeated use, and to withstand the most extreme outdoor conditions (it's splash-proof, drop-resistant, and dirt-proof) while camping, hiking, mountaineering, or simply on the go. I love that each power outlet features a rubberized cover to use when not in use! This fabulous power hub allows you to power up to four devices at one time, with two USB outputs, one USB-C output, and an AC power output. It features a super easy on/off button on the face of the hub and an easy to read LCD display screen that shows you the charge level. You can even charge up the Portable Power Outlet while you're charging your devices. I don't do much camping anymore, but I take my Portable Power Outlet Charging Hub along with me on road trips and plane trips. It's a wonderful travel accessory and it's safe to take in the airplane cabin with you. My older-style laptop doesn't hold a charge for very long, so taking the myCharge along on the plane allows me to plug in and use my laptop on long flights. Best of all, I fully charged the myCharge Portable Power Outlet Charging Hub and Inverter in less than 2 hours! And, if no devices are being charged, it will automatically turn its power off in 60 seconds to retain power. I have never, ever had a myCharge product fail on me. Every product I've ever used from myCharge did exactly what it was advertised to do or better. The myCharge Portable Power Outlet is an excellent gift for anyone. They offer a wide variety of portable power solutions at www.mycharge.com. Check out their entire line of products and find the one that works best for you and your lifestyle, then order some for holiday gifts!